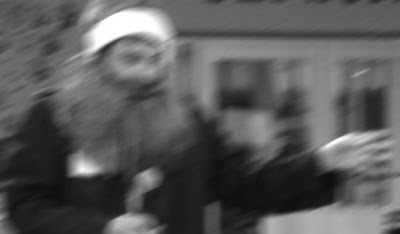 Hanukkah Harry, the so-called “Jewish Santa,” visited Chicagoland’s synagogues shortly before starting his eight night global trek. Last year, Harry visited Chicagoland to reassure children following the Sandy Hook Elementary School shootings. This year, he returned to celebrate Hanukkah occurring on the same week as Thanksgiving. Some experts claim that on each night of Hanukkah, Harry delivers small gifts to Jewish children, with permission of their parents. Harry confirmed this, but added that a lot has changed since his last visit to Chicago. “NBC tried to sue me.” Said Harry. “They had the nerve to say that because Saturday Night Live did a sketch about me, that they own me. Me! I’ve been around for over 2000 years, and they want to own my likeness and my gifts to the children of the book?” Harry then said some words in Hebrew that this reporter couldn’t understand. Since NBC dropped the lawsuit, Harry decided to focus more on the traditional story of Hanukkah. Speaking to audience at Temple Sholom, Harry explained, “Gifts are fine, but let’s not forget that we’re celebrating a miracle. The miracle of a flame burring for eight days with only one day fuel. I want to make sure that I’m spreading the joy and wonder of that miracle and teach our children to appreciate it as well. All of his stops included organizing games for the visiting children, and handing out prizes. He also spoke with with their parents to schedule visits on Hanukkah. Harry even visited the controversial Jewish humanist congregation, Kol Hadash. There, he allowed the children to examine his cart and answered their questions about how he travels around the world in eight days and visits all Jewish families. Unfortunately, not all of Harry’s visits went smoothly. Most Orthodox congregations refused to admit Harry. Anshe Sholom Bnai Israel required harry to show his family tree, and prove that his mother was of Jewish decent before they would let him meet their children. A spokesperson for Anshe Sholom Bnai said they only wanted to confirm Harry’s identity in order to protect their children. At all the gatherings, many children seemed excited to see Harry.